The Rough Collie Breed Council’s influence stems from its ability to present a unified voice to our governing body The Kennel Club. Arguably it’s most spectacular success came early with the clarification of the Collie Breed Standard in 1968, and one is tempted to suggest that no such clarification would ever have been achieved had it not been for the Rough Collie Breed Council even though the original negotiations took place before its foundation. The Breed Standard has always exercised the concerns of the Rough Collie Breed Council members. 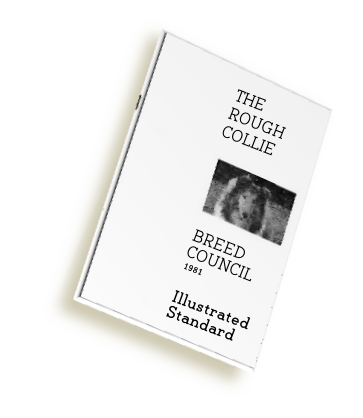 In 1981 it published an Illustrated Collie Breed Standard in an attempt to guide and educate those who were not quite so familiar with the Collie’s nuances. Before the end of that decade it was again in discussion with the Kennel Club, this time in an effort to restrict any relaxation of the high standard set by the Breed’s founding fathers after the Kennel Club had undertaken it’s all embracing review of all Breed Standards. The granting of Championship Status to all Kennel Club registered Collie Breed Clubs, the latest episode culminating in the Rotation of Challenge Certificates between all Clubs. The registration or otherwise of any further regional Breed Clubs, where it has generally been thought that existing clubs could better provide for any perceived shortfall in national coverage. The training, selection and approval of judges has exercised the minds of Member Clubs throughout the Rough Collie Breed Council’s history, although it is a subject that is unlikely to ever be fully resolved. The clashing of dates and over crowding of Championship Shows throughout the show calendar. Ring size and location, benching and ancillary services provided for Rough Collie exhibitors at United Kingdom Championship Shows. The Kennel Club sought the opinion of both Rough and Smooth supporters concerning the continued practise of interbreeding the two varieties, before any final decision was taken. The permitted colour descriptions when registering Rough Collie puppies. This arose after the Kennel Club started to publish colours against the names of all registered dogs, which demonstrated many fanciful descriptions used by some breeders.